His Famous Interview Regarding the Third Secret of Fatima and the Predicted "Aurora Borealis" That Signaled the Start of WWII Could there be a connectiion between the blood red aurora borealis shown in the above video and the same from the Fatima Prophecy? CURRENCY CRISIS AHEAD- IN THE EVENT OF A DISASTER, DO YOU HAVE WHAT YOU WILL NEED TO SURVIVE? Are you ready for what is coming? Most importantly-- Is your spiritual life in good order? You know what to do here but be sure you do it. Next--Can you provide safe drinking water for yourself and your families--even if need be, from a pond or creek? Do you have food assurance for the coming food shortages and expected famine? It might last years. What will you do if the power grids fail? How long could you make it without lights, dry taps and the ability to cook your food? How long could you last if your gas generator runs out of gas? These are just a few of the concerns that should be addressed NOW, in early October. "He who doesn't use the eyes to see will use them to cry"
World Governments and Nations Have Seed VAULTS-so should you. Just maybe they know something we don't. 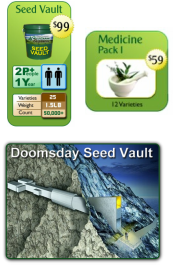 Many economists say food and seeds will be the currency of the future. COULD IT HAPPEN HERE? We see the stories on the news everyday- war threats, droughts, floods, tornados, declining bee populations, genetically modified foods, financial collapse, climate modifications/changes, just to name a few. Survival gardening is no longer just idle talk by a few naysayers. Sometime in the near future, your backyard garden could very well be what stands between you and your next meal. Many economists say Heirloom Seeds are better than Gold or Silver. Could be...after all, you can't eat gold or silver, right? Free DVD. This DVD covers everything from private revelations from mystics and saints to upticks in earthquakes, droughts, Planet X or Nibiru, expected earth changes and eventually Christ's return. Check box for free DVD on "Contact Us" page.